Building a self-balancing robot is one of those things that every hobbyist and engineer want to do. But there are a few hurdles for a lot of people. There is the theory on the one hand and then there is the mechanics on the other. In this and the next few posts, I will show you a self-balancing robot I recently built and will explain in details on some of the most important aspects. I thought that the low cost requirement is an important one as people tend to shy away from projects that need hundreds of dollars. Luckily, you can build a surprisingly good balancing robot without having to spend a fortune, especially if you are willing to build all the electronics yourself. If you have a toy truck lying around, you can then re-purpose it without having to buy one (I re-cycled a broken one from my son), this would cut your total cost down to around $20. Simplicity is another important factor. In order for the control algorithm to work successfully, you have to understand the principle behind it. The more complex the control algorithm is the more there is room for error and thus keeping everything simple is the key to a successful build. It is a good idea to keep things simple and only move on to more complex implementations after you have understood everything. Now let’s move on to to the theory. I am not going to bore you with the excessive math here but if you are interested, there are a lot of excellent sources for the math behind this. For those who already know the theory and just want to see the implementation, you will have to wait for my next post. Making a self-balancing robot is essentially solving the classic inverted pendulum problem. While the math is a bit complex, the essence is quite simple: the goal of the control loop is to adjust the wheels’ position so that the inclination angle remains stable at a pre-determined value (e.g. the angle when the robot is balanced). When the robot starts to fall in one direction, the wheels should move in the falling direction to correct the inclination angle. And heuristics tell us that when the deviation from equilibrium is small, we should move “gently” and when the deviation is large we should move more quickly. To simplify things a little bit, I limited the robot’s movement to be on a straight line (e.g. only forward and backward motion but no turning) and thus both wheels are moved at the same speed in the same direction. Under this restriction the calculations become much simpler as we only need to worry about sensor readings on a single plane. If you need to allow the robot to make turns, then you will have to control each wheel independently. The general principle remains the same nevertheless since the falling direction of the robot is still restricted to a single plane. In the next couple of sections, we will discuss the method used to accurately estimate the inclination angle. As mentioned above, we would need to get a good measurement of the current inclination angle in order to control the robot’s movements. Let’s first examine how to use an accelerometer alone to measure the inclination angle. By only measuring the x axis reading of the accelerometer we can get a rough estimate of the inclination angle. Of course, this is under the assumption that the robot is standing still. In reality, when the robot is not in balance it will accelerate towards the direction it is falling and thus the x axis reading of the accelerometer will be slight more than Ax due to the acceleration. At the same time, the y axis reading will be slightly less than the reading in standstill condition (Ay). 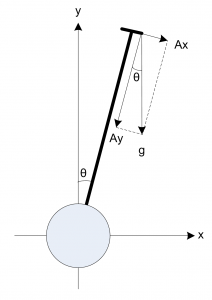 As a result, the combined vector will deviate from g. But when the accelerometer is placed near the center of gravity of the robot, the acceleration along the x axis is small in near-equilibrium conditions. So the above equation will exhibit some small error, but it remains a good approximation of the inclination angle. Accelerometer tends to be very sensitive to the accelerations introduced due to movement or vibration and thus the sensor readings will contain some level of noise, which can not be removed easily. So by relying on accelerometer readings alone, we can not get a reliable inclination angle estimate. To address this issue, we will have to rely on some other measurements. Unlike the accelerometer, gyroscope measurement is largely immune to none angular movement and thus far less susceptible to vibrations and lateral accelerations mentioned previously. But since the angular measurement is cumulative, any minute error in measurements will manifest over time which causes the estimated angle to deviate from the true value. This is the so called drifting effect. Thus gyroscope alone cannot be used to reliably measure the inclination angle either. To address the issue of measurement noises and the limitations of measurements by either the accelerometer or gyroscope alone, we will need to combine the readings from both the accelerometer and the gyroscope in a meaningful way so that we could use the strengths from both sensors to obtain a more accurate result than either measurement alone could provide. This is the classic application of sensor fusion. Since accelerometers can provide accurate angle calculations when there is no acceleration and gyroscope can provide accurate short-time angle measurements. These complementary traits are ideal candidates for sensor fusion. Some sources confuse the concept of sensor fusion with data filtering. As mentioned before, the concept of sensor fusion is to combine the measurements from multiple sensors in hope to obtain better measurement results. This can be done either in conjunction to or independent of filtering. 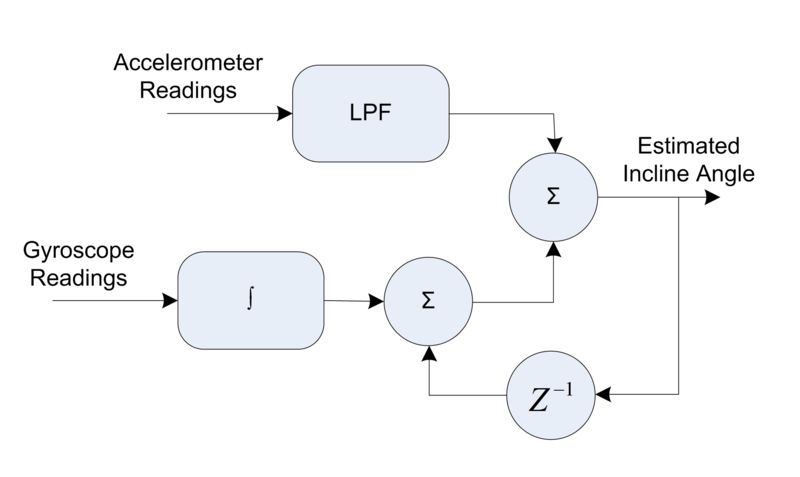 Like many processes in the physical world, sensor readings from the accelerometer and the gyroscope can be modeled as the true measurements with added white Gaussian noise (AWGN). Many filters in the least mean square filters family are suitable for this kind of stochastic process. Kalman filter is one such adaptive filters that can be used to filter the sensor data from accelerometer and gyroscope. Even though the implementation of Kalman filter is quite straight forward, in order for the filter to be optimal we needed to know the precise underlying model of the system and we also need to be able to reliably estimate the noise covariance matrices. Without any reliable information on these parameters, the filter may still work but will not be in an optimal sense. Simpler methods can be used in situations where the these parameters are unknown and can still achieve reasonably good result. 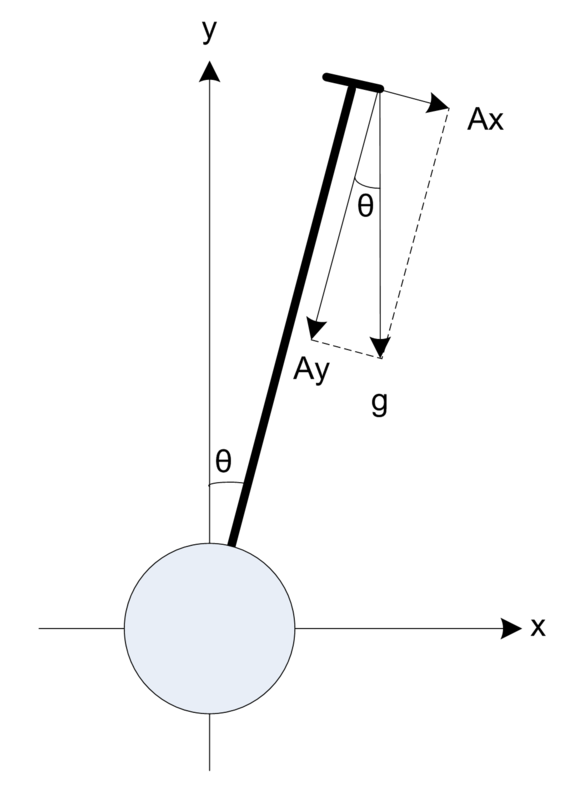 Where G is the gyroscope reading and angle Ax is the angle calculated from the accelerometer reading in equation (1) above. The weights are chosen such that the gyroscope drift can be corrected reasonably fast while the transient errors in accelerometer measurements do not cause the estimates to vary too much from iteration to iteration. These parameters are sensitive to the sampling period but as a rule of thumb, gyroscope readings should be given a much higher weight (e.g. >0.9) since they are less noise-prone and accelerometer readings should be given a lower weight (e.g. <0.1) as its angle measurement is noisy and it is used only to correct gyroscope's drift. More detailed background information can be found in this excellent presentation. The technique of filtering using linear combination of values from multiple sensors is sometimes casually refereed to as complementary filtering, and it is widely used in many data fusion applications. It can be shown that this simple filtering technique we used above is after all a special case of the more generic Kalman filter. The main difference is that in our implementation the gain is fixed instead of iteratively computed. Since we assumed that the noise covariance matrix is unknown (or we chose not to measure it), the complementary filter solution should function as well as a Kalman filter with randomly tuned parameter values if not better. But if the covariance matrix were precomputed according to the underlying physical process model, the Kalman filter would have been the optimal choice. In my next post, we will use equations (1) to (4) in our implementation. In the section above, we discussed the method for obtaining a more accurate inclination angle estimate based on the values provided by both the accelerometer and gyroscope. We now need to control the motor accordingly use this estimate so that the robot can remain stand balanced. The simplest method one may attempt to employee is to rotate the wheels in the falling direction until the inclination angle reaches the value at which the robot is in balance. Heuristically, the wheel rotation speed should be proportional to the inclination angle (e.g. move faster when the angle is larger and move slower when the angle is smaller) so that the robot moves smoothly. This technique is effectively the simplest PID control with both the I and the D terms set to zero. In practice though, a full PID implementation is generally needed to make the inverted pendulum stable. 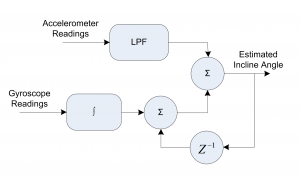 This application note from Microchip offers detailed explanations on how to design a PID controller for inverted pendulum application. Is it possible to put this circut on a platform that’s strong enough to be rideable? Are there any changes that would have to be made to it? Absolutely, in fact there are a lot of DIY Segway builds around. In some ways, it is actually easier to balance a full sized vehicle than a small model as the center of gravity is much higher. The control theory behind is virtually the same. But cost and safety become important when you are building a rideable one. First congratulations for the project, I have some doubts, you used the accelerometer MMA8453QT or MMA8453QR1? There is no functional difference between MMA8453QR1 and MMA8453QT. R1 and T just refer to the packaging type (reel or tape), the devices themselves are identical. The same is trrue for LPY450AL and LPY450ALTR (the latter is in tray whereas the AL version is tape). I did everything as you mensionou the project appears in my serial monitor what is below, but the pin 5 and 11 ATMEGA328P have nothing, what can be? Hello, Kery D.Wong!! I want to make selfbalancing robot but I do not understand the implementation of kalman filter, can you help me pls?? ?